Maes y Mor in Criccieth, near Porthmadog, Gwynedd sleeps 8 people. Maes y Mor near Porthmadog is a spacious, detached property which enjoys a delightfully convenient location just 10 yards from the beach and a short walk from a good selection of restaurants and shops in the popular and picturesque resort of Criccieth. Boasting fabulous sea views out over Cardigan Bay towards Harlech, and views of the town’s medieval castle, Maes y Mor makes an ideal family base for summer seaside holidays and relaxing winter escapes. The property is perfectly located from which to enjoy the superb range of outdoor pursuits in the nearby Snowdonia National Park and the rolling countryside of the LLeyn Peninsula. Just 4 miles away is Porthmadog, departure point for wonderful steam train journeys on the world famous Ffestiniog Railway as it winds its way deep into the Snowdonia National Park. The Italianate village of Portmeirion, location of the cult TV series ’The Prisoner’, and the Festival Number 6, an annual arts and music festival, is just 7 miles. There is a good selection of golf courses close by along with easy access to the coastal path for superb walking opportunities, taking in those stunning views across Cardigan Bay. There is a beach 10 yards from Maes y Mor near Porthmadog. With the shop and pub 500 yards, and the restaurant is 10 yards from Maes y Mor. Living room: With open fire, Freeview Smart TV and wooden floor. Kitchen/dining room: With range, electric cooker, microwave, fridge/freezer, dishwasher, washing machine, seating area and patio doors leading to garden. Bedroom 4: With double bed and restricted headroom. LPG central heating, electricity, bed linen, towels and Wi-Fi included. Initial fuel for open fire included. Welcome pack. Lawned garden with patio. Private parking for 4 cars. No smoking. Holidays at Maes y Mor run from Saturday to Saturday. Pets allowed at Maes y Mor. For a better idea of where Maes y Mor is, you can see Maes y Mor on the map below. Maes y Mor is in Gwynedd; should you be on the lookout for a special offer, you can find all the special offers in Gwynedd. It's always worth checking to see what is on offer at the moment. 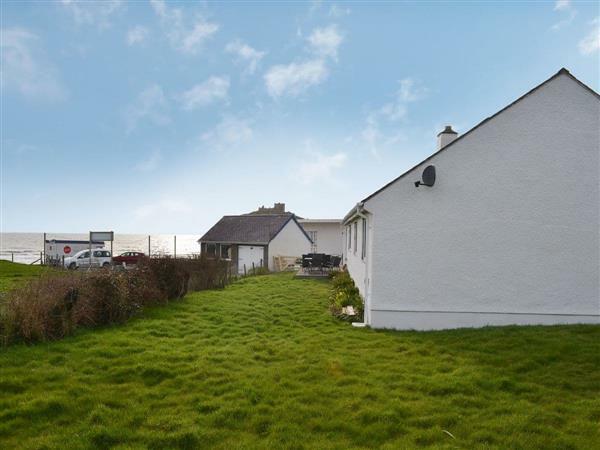 Do you want to holiday near Maes y Mor (UK10691), you can see other cottages within 25 miles of Maes y Mor; have a look to find your perfect holiday location.